Mars Global Surveyor passes over the north polar region of the red planet twelve times each day, offering many opportunities to observe how the polar cap frosts and dunes are changing as the days goby. Right now it is summer in the north. 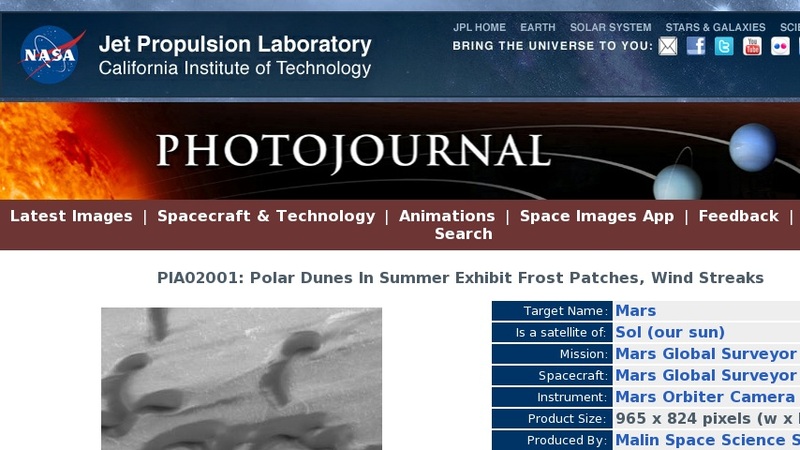 This picture, taken the second week of April 1999, shows darks and dunes and remnant patches of bright frost left over from the winter that ended in July 1998. Dark streaks indicate recent movement of sand. The picture covers an area only 1.4 kilometers (0.9 miles)across and is illuminated from the upper right. Malin Space Science Systems and the California Institute of Technology built the MOC using spare hardware from the Mars Observer mission. MSSS operates the camera from its facilities in San Diego, CA. The Jet Propulsion Laboratory's Mars Surveyor Operations Project operates the Mars Global Surveyor spacecraft with its industrial partner, Lockheed Martin Astronautics, from facilities in Pasadena, CA and Denver, CO.